Painful periods are the second chief symptom of endometriosis and can be thought of as abnormally painful cramping during one’s period. They can be excruciatingly uncomfortable, often forcing women to not take part in their day to day activities. What is the difference between painful periods and normal menstrual cramps? Light cramps during a period are normal. They may be uncomfortable, but an over-the-counter pain medication should ease the pain enough to allow a woman to continue her day. Painful cramping due to endometriosis , however, is not “normal” cramping. These cramps are frequently associated with very heavy and prolonged menstruation (menorrhagia), often including blood clots. These cramps may start out feeling like normal menstrual cramps, but the level of pain can suddenly and quickly escalate to an incapacitating level. These cramps can occur not only during menstruation but also during ovulation. How can painful periods affect quality of life? The pain from cramps due to endometriosis is so severe, so intense, that it can completely alter a woman’s daily life. She may have to stay home from work, school, or other activities, perhaps for days at a time. She may not be able to play with her kids or drive them to their appointments. She may have to excuse herself in the middle of a social function and find somewhere private to lie down so that she can catch her breath and try to mentally get through the episode. She may not even be able to get out of bed and prefer lying on her bed in a fetal position, unable to move. Killer cramps kill whatever a woman is doing or wanting to do at the time. They aren’t just a nuisance that she has to deal with, like normal cramps. They take over her life. They take charge of her. How do painful periods differ from abnormal periods? Abnormal periods, the first fundamental symptom of endometriosis, may include painful cramping. Abnormal periods can also include gastrointestinal discomfort, leg pain (neuropathy), and more, whereas painful periods are often associated with heavy and prolonged menstrual flow (menorrhagia). Both are common symptoms in endometriosis patients and are thus closely linked. However, just because a woman does not experience painful periods or heavy bleeding, does not mean endometriosis should be ruled out. An abnormal period can still be occurring, with painful and heavy menstrual bleeding not occuring, due to the backward flow of menstruation. Thus, even if a woman does not experience painful periods, but she presents some of the other symptoms of abnormal periods, such as nausea and vomiting, bowel and bladder dysfunction, etc. endometriosis can still be the root of these issues. If one’s symptoms don’t revolve around their period, they must not have endo. Although period pain is the number one symptom associated with endometriosis, many women’s symptoms occur right before their periods, during ovulation, or throughout the entire month. Due to the taboo surrounding periods, many women are told cramps are normal. Some cramps are normal, but killer cramps are not. Many patients with endometriosis will try to convince themselves that what they are feeling is normal for all women, especially if their doctors, family and friends insist this is true. They will continue their day-to-day activities. It is important to note that if a patient is experiencing severe pain, this feeling is real.If the pain is debilitating, patients should urgently inform their gynecologist. 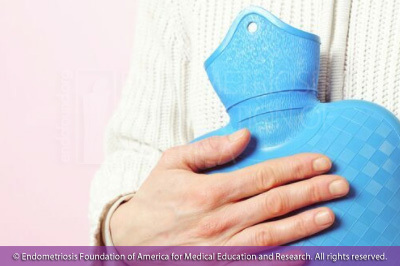 Heating pad - Whether using a heating pad from the drugstore or taking a warm shower, many women suffering from abnormal cramps find comfort in applying heat to the abdominal and pelvic cavity during their period. Pain medication - Simple over the counter pain medications, such as Ibuprofen (Advil, Motrin, etc.) or naproxen (Aleve), are frequently used to relieve menstrual cramps. 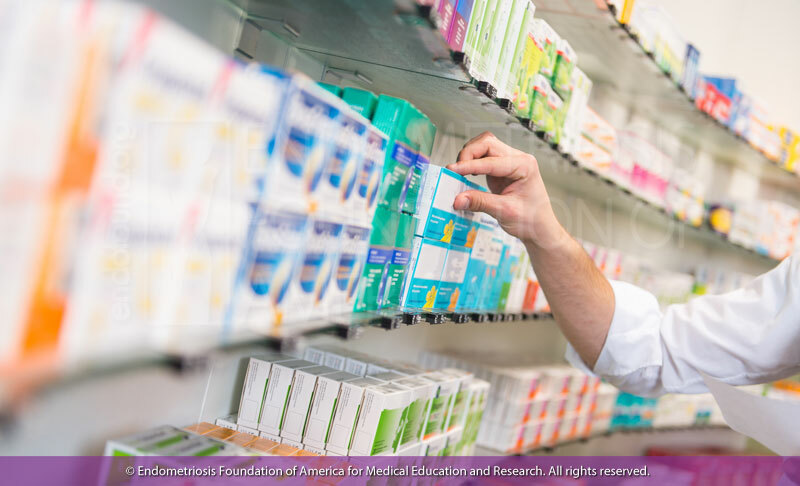 It is important to note that not every person is the same, and what works best for some may not for others, so it is important to find the medication that best fits a particular case. Simple over the counter medications, such as non steroid anti-inflammatories can help in relieving painful period symptoms for some patients. Oral contraception- Birth control has been found to have a number of useful measures outside of contraception. Many patients have found that it helps to relieve pain from menstrual cramps during their period.